The discovery of the metal changed the human’s life in the ancient world. This metal-helped farmer by providing efficient tools and for armies that possessed knifes, swords and shields, etc.… Metal plays a very important role in our daily life, which has been extracted from the earth by mining ores. Metals are malleable; they can be hammered to get a desired shape without breaking or cracking as well as fusible. Metals have lustrous surface hence it is used for ornaments and for decorative purpose. Metal art is very old and traditional art. The origin of metal art started at the time of Indus Valley civilization, a beautiful statue of a ‘dancing girl’. In India, there are so many places holds unique styles of metal art and Kerala is one of them. Some of the precious metals such as gold, silver, copper, bronze and brass has been a popular and useful for thousands of years. Copper is one of the most useful metal, and probably the one first used by human. Brass is an alloy of copper and zinc and with the addition of small amount of other elements for some special uses. The color of brass varies from dark reddish brown to a light silvery yellow depending on the amount of zinc present, the more zinc, the lighter the color. Brass is specified because of its unique combination of properties, stronger, harder, and gold like appearance and durability. In ancient India the artists showed their talent in stone carvings in and around the temples. The ruins of the Vijayanagar kingdom at Hampi are the good examples of brass work brought in to focus by the ancestors of Pembarthi craftsmen. Manichithrathazhu locks; the name derived from the sound of the bell and the creative artwork on it. 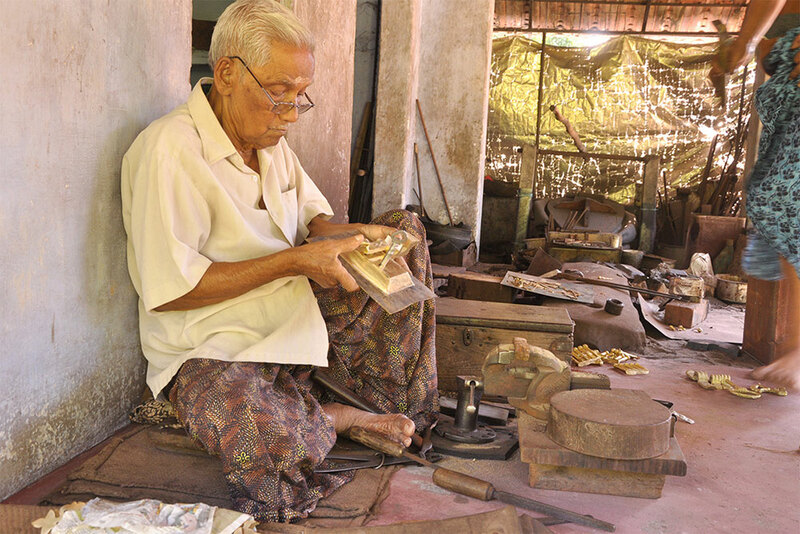 Manichithrathazu is famous for its unique style of traditional metal engraving artwork. In olden days only in kingdom territory, the ancient homes, Nalukattu and Ettukettu (four sided and eight sided) were using these locks. These wonderful door locks are ornamented in traditional manner mainly used to embellish the front doors of mansions in Kerala. These locks are usually preferred for split doors to get a traditional look. These locks are made of Brass to keep it glowing for long years. It weighs up to 3 to 5kgs and the price starts from 12,000 to 55,000, which is depending on the gauge and design. These traditional locks can make it in any shape or size according to the door designs of mansions and temples. Manichithrathazhu is a traditional lock, which is totally different from other modern lock system. It is a long lasting with no complaints. Mr. Sridharan from Paravoor, Kerala is one of the well-known craftsmen who have experience of sixty to sixty-five years in making of Manichithrathazhu locks. 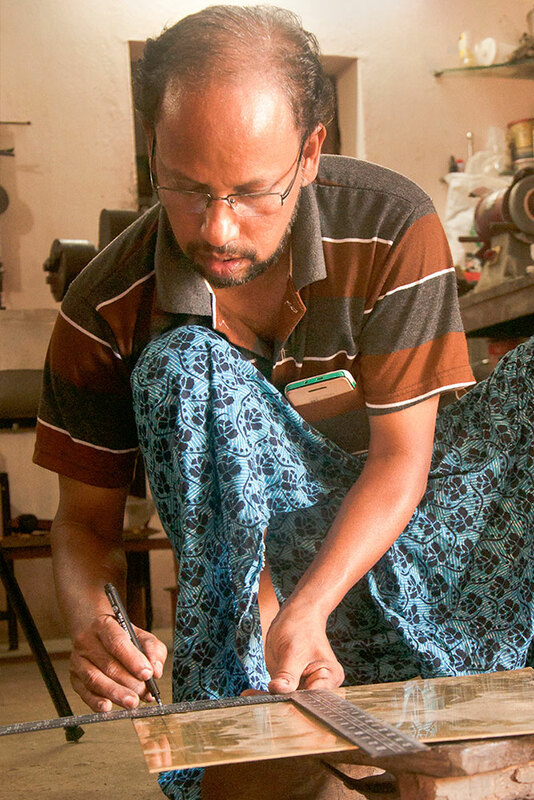 He got this unique talent from his ancestors and his sons, Udayan (elder son) and Vishwanathan (younger son) continuing this work by helping him from past thirty to thirty-two years to follow the family tradition. Once it set properly to the required place, it will work for generation. Since they are experienced they will get one or two orders per month. They have done these traditional locks for temples, churches and mansions.